malygos – Welcome to Spinksville! I know that a lot of players feel that storytelling is a sideshow to the main event in games; it doesn’t involve gameplay, and it’s seen as fluff to keep the punters/ fanfic writers amused. I don’t agree with this view, I think the role of storytelling in games is to make encounters feel meaningful – why else would we care about characters and avatars like Lara Croft, Sonic, sackboy, Commander Shepherd; might as well just represent the player by a giant blue square. But like it or not, the quality of storytelling and NPC design has a huge effect on how players respond to different parts of the game. Or in other words, the virtual reward of being able to deliver a good kicking to an NPC who people truly hate is on par with epics for a lot of people. After all, the epics will get replaced soon enough, but the storyline is a lasting memory and experience. So, in that vein, which is the most unpopular storyline in Wrath? It’s undoubtedly the blue dragonflight – we kill an aspect (that’s like a demi-god) and no one cares. A few completists wonder whether that story was supposed to tail off, and everyone else is glad that Blizzard seems to have buried it. This is partly because of an unpopular raid fight which involved awkward vehicles, but it’s also because the writing didn’t make us care. Piss him off by killing his consort? That was your entire plan? I’ve had the great misfortune to play through Colderra again on an alt recently. It’s a subzone of the Borean Tundra in Northrend (ie. this is Wrath content) and although it’s not horribly painful as an experience, it’s also not a shining beacon of level design. Kill 10 x, collect 10 x, return to quest giver and be told to kill or collect x other things. And so on. But the low point of the zone is the Keristrazsa questline. A game like Dragon Age would have nailed that storyline, because it has all the right elements. A wronged prisoner seeking righteous revenge, enlisting the PCs help, everything goes pear shaped and she ends up in a worse state than before, doomed to have her mind broken and forced to become Malygos’ new consort. Now that really should have been good story material. But not in the hands of Blizzard writers, oh no. You discover the arcane prison and one of the NPCs at the local base is able to unlock it. He tells you to open the prison at your own risk. When you do so, a pretty girl who is really a dragon appears. Malygos (big bad dragon aspect who will die to countless raid groups later on) has imprisoned her – boo. We don’t entirely know why but she’s out for revenge. You agree to help, having already been told that the blue dragonflight are the bad guys here. She has you gather some stuff so that she can lay a trap for Malygos’ consort, who you later kill on her behalf. OK, so that was kind of random revenge fantasy on the NPCs part but I guess she has been imprisoned for ages and that has to take it out of you. Then she moves to the next stage of her plan. She has you lay out the consort’s corpse on the ground and she burns it, and calls out to the dragon aspect to come look at what she has done. Now, this really should set danger warnings because dragon aspects are very badass. In any case, he comes out of the Nexus to mourn? (Well, he laments about the consort so he’s actually got more sympathy at this point than the NPC you’re helping.) Keristrazsa literally flies loops around him for no special reason, she doesn’t seem to want to attack. Then she lands, tells you to run away and … Malygos comes down and spirits her away to an instance. I’m not sure why being frozen in an instance is going to persuade her to be his consort. In any case, when you get to the Nexus, she’ll beg you to kill her so she can hand over some epics … or something. It’s just that bad. It doesn’t make sense on any level, it’s confused, the characters are stupid and yeah. I got nothing. Dragons have really failed to impress. Again. Except Onyxia. Since learning that dual specs were coming in patch 3.1, I’ve been very reluctant to respec. I think — oh man, if I can just wait a couple more weeks I’ll be doing this as much as I want, do I really need to spend this 50g on respecs right now? Actually it’s down to 45g at the moment (note for non-WoW players, the costs of respecs go up by 5g every time you do it until it reaches a max of 50g, then for every month you don’t respec the costs start to go down again.) I know this because I respecced to Fury for Monday’s Malygos raid, which was our fastest 25 man raid in history. It was a quick and easy one-shot. I have missed my occasional Fury respecs, dammit. There is something about clicking on those talents and then having to manually equip two 2-handed weapons because my wardrobe addon won’t do those for me that says YES! UNLEASH THE BEAST! TWO 2-HANDERS, IN CASE ANYONE DIDN’T GET THAT!! I was also amused that I’d been teasing our tankadin about the relative uselessness of block value gear, and he’d made some comment about 5-figure shield slam values. If that ever happens for me, it’ll be in some gimmick fight like Thaddius where everyone’s damage is crazy buffed … and I wouldn’t be using block value gear. Or if someone accidentally blows up a spore on me at Loatheb. But I did see some some 5-figure crits pop up when I was swinging away on Malygos in my Fury gear. RAR!! When I talk about my experience with Fury I want to TYPE EVERYTHING IN CAPITAL LETTERS WITH EXCLAMATION MARKS!! Fury spec is just that metal. I don’t find it as involving as tanking and I’d get bored fast if I was a full time dps warrior but damn if it isn’t fun. It’s the only spec on any class I have played that makes me giggle. Usually when those 10k+ crits come up. I’m going to talk more about 10 man raids later this week but one of the great things about them is being able to pick up off-spec gear easily. I do this without really thinking about it, if dps plate drops and no one else wants it, I just hoover it up. And I always stick some sort of enchant/ gems on new gear, even if it is just something cheap. It’s the perfectionist in me, I can’t stand leaving the gear ‘naked’. So my off-spec gear is really not bad at all. I had about 200 hit, 17 expertise, 4k attack power, 34% crit. It’s just that most of the time the off-spec gear stays in my bags, and I’d never actually put it all together like that before. And this was all without ever ‘stealing’ gear from a primary dps. OK, OK, I’m just coming to that. Well, apart from the bit where I got 10k cri— oh yeah I said that already. When the dragon was dead and we checked the loot, there was a collective oooooo on voice chat. 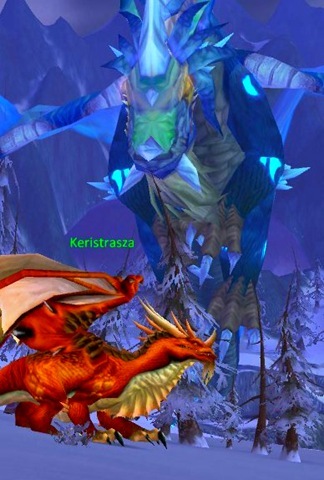 Reins of the Azure Drake were waiting enticingly in the loot chest. 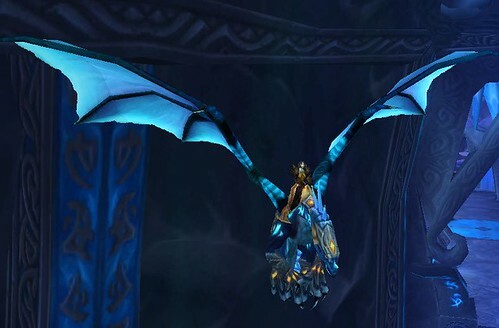 This is a rare flying mount, and one of the prettiest. You can just about see the head armour in the screenshot below, it is the only armoured drake in the game. There was much excitement. I didn’t win it, but here’s a picture of the beast in the capable hands of the lucky warlock who did!